Showtime Arena has easy access to the interstate system as it is 4 miles south of I-94 and 9 miles East of I-90 at the Madison exit of Hwy 12 & 18; for the Illinois horseman Showtime Arena is 12 miles North of I-90 at the Hwy 73 exit. The Arena is one mile North of Hwy 12 & 18 on Oak Park Road. Click Here for map to Showtime Arena. Showtime Arena is nestled in a wooded valley along the Koshkonong Creek. Showtime Arena offers plenty of level gravel and grass parking with shade, 30 electrical hook ups for RVs and 103 stalls. It offers two indoor arenas, and one outdoor arena complete with lights. The main indoor arena is 72’ X 203’ with roping chutes, 30 stalls attached all under one roof and is heated. Barn #2 has 19 stalls and a 50’ x 100’ heated indoor warm up arena. Barn # 3 has 54 stalls. The outdoor arena is 150’ x 270’ complete with roping chutes and cattle holding pens. There are three round pens, a horse walker and two outside wash racks. There is an enclosed entry and announcer stand inside and outside with a PA system that goes through all arenas and barns. Showtime Arena has hosted all types of Breed Shows, Open Shows, Roping, Team Penning, Jumping, Dressage, Barrel Racing, Mounted Shooting, Horse Pulls, Draft Shows and various types of Clinics. 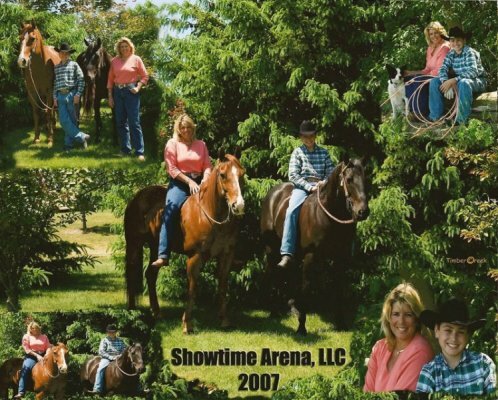 We here at Showtime Arena are very confident that we will meet all your horse show needs year round. We invite you to stop by or call any time. All bookings are included on our web site, and upcoming event calendars.